N-3000CR: 1.2 volt 3000mAh rechargeable NiCd "C" size battery cell. Replaces KR-CHE2. Panasonic brand. Flat-top battery, available Plain, or with Solder Tabs (1 metal strap spot-welded on the top, and 1 metal strap welded on bottom) for $0.25 xtra. 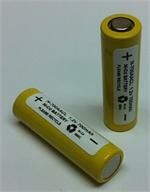 N700AAC: 1.2 volt 700mAh AA-size rechargeable Ni-Cd battery cell. Size: 2" tall x 0.56" dia. Weight = 0.77 oz. Choose Plain (button Top), or w/ Solder Tabs (for assembly; $ 0.25 extra per cell). KR-1100AAU : 1.2 volt 1100mAh rechargeable Ni-Cd AA battery cell (flat top style). Available plain or with Solder Tabs. Priced at $2.95 per cell (plain), or $3.20 per cell with solder tabs welded on. N-1800CK : SANYO brand HEAVY DUTY C-size rechargeable Nickel Cadmium battery cell. SPECIAL VALUE. N-1800CK : SANYO brand HEAVY DUTY C-size rechargeable Ni-Cd battery cell. Available plain (buttop top), or with Solder Tabs ($0.25 extra per cell.) SPECIAL VALUE. KR-1300SC : 1.2 volt 1300mAh rechargeable Sub-C size Ni-Cd battery cell. Available Plain or with Solder Tabs. 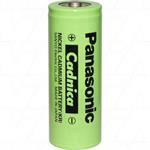 KR-1300SC: Sanyo-Panasonic brand 1.2 volt 1300mAh Nickel Cadmium rechargeable Sub-C battery cell. These are high-quality rechargeable Sub-C cells; this cell is ideal for rebuilding a variety of cordless tools/devices. 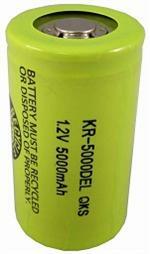 KR-1800SCE: 1.2 volt 1800mAh Sub-C size rechargeable Ni-Cd battery cell. Available plain or with Solder Tabs. KR-1800SCE: 1.2 volt 1800mAh rechargeable Ni-Cd Sub-C size battery cell. This cell offers high-capacity, long service life, and very high quality. New Panasonic product - same product, same production lines as older SANYO cells. The N-700AACL is a SANYO-brand 1.2 volt 700mAh AA rechargeable Ni-Cd battery. 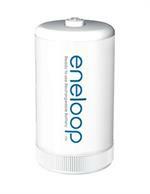 Special low-profile, flat-top style battery cell; IDEAL for replacing in solar lights. Height approx. 1.9"; diameter approx. 0.555". N-1250SCR : Sanyo brand high-output rechargeable 4/5 Sub-C size Ni-Cd battery cell. Available plain or with Solder Tabs. 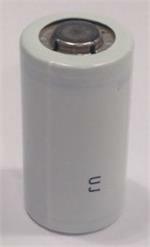 N-1250SCR: SANYO-brand 1.2 volt 1250mAh rechargeable 4/5 Sub-C Ni-Cd battery cell. Dimensions: 1.31" tall x 0.88" diameter. Weight = 1.79 oz. These have RED shrink wrap. Can be slow-charged or Fast-charged. Available Plain, or with Solder Tabs. N-1900SCR: SANYO brand Ni-Cd Sub-C cell. High-output / high-capacity / high-performance battery. KR-5000DEL: 1.2 volt 5000mAh rechargeable Ni-Cd flat-top "D"-size cell. Choose PLAIN (flat top) or w/ Solder Tabs (for assembly - $ 0.25 extra per cell). KR-7000F : 1.2 volt 7000mAh rechargeable "F" size Ni-Cd battery cell. 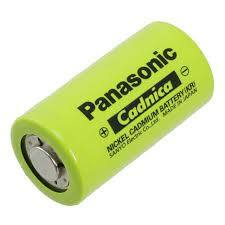 KR-7000F: SANYO-Panasonic brand 1.2 volt 7000mAh "F"-size rechargeable Nickel Cadmium battery. Cell is 3.58" tall x 1.34" diameter. Weight = 8.11 oz.